Samsung Mobile introduced the Galaxy S8 and S8+ to the world, a smartphone that pushes the boundaries of traditional smartphones far behind. Is your app ready for the 8th generation of the Galaxy S series? You thought about testing it, but don’t have enough available devices that are put in the hands of qualified QA engineers? 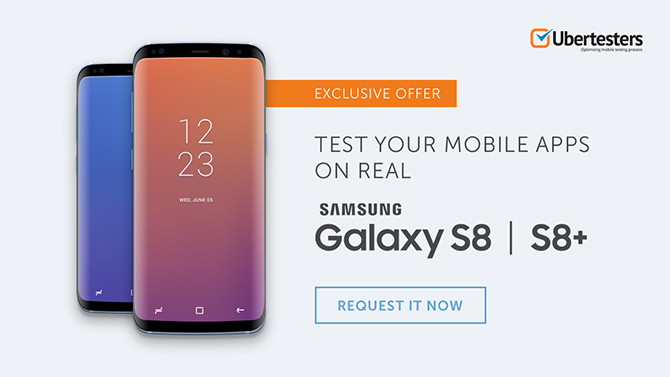 With Ubertesters it’s easy to test your mobile app products on real Samsung Galaxy S8 | S8+ devices, in real life conditions, in any target market, and with real testers. Start using Ubertesters’ crowd testing service NOW and be sure that your products work properly!